Spag Burger is located on E. 9 Mile in Eastpointe. Photo by Spencer Rajewski '21. 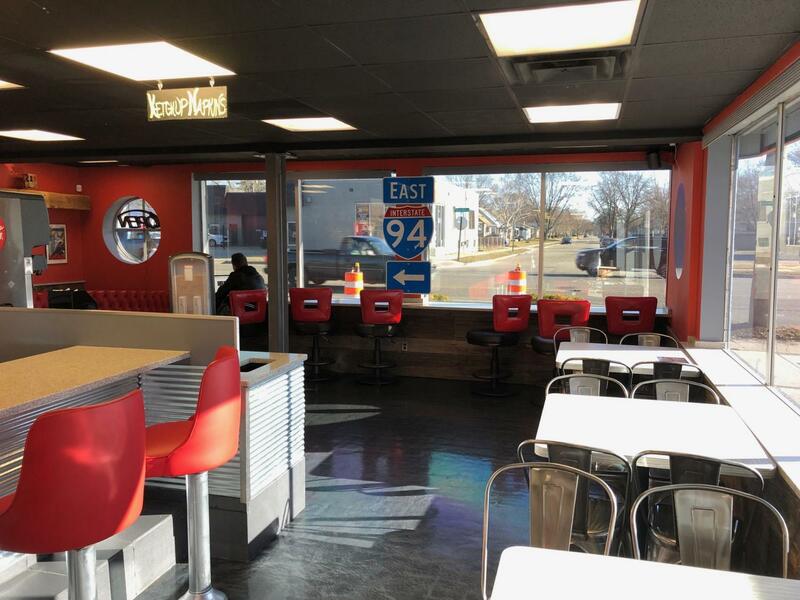 Burger lovers, prepare for the newly-opened burger joint, Spag Burger, on E. 9 Mile in Eastpointe. Specializing in craft sandwiches and shakes, this modern diner opened up on March 18, 2019 and offers carry out and dine-in options. Spag Burger is a family collaboration between Chef John Spagnuolo and his son, Chef Andrew Spagnuolo. Both are food aficionados and amazing chefs who love fantastic, great-tasting, fresh food. The Spag family originally opened it up as a A&W drive through where the servers came out to the customers’ cars. My brother and I made our way out to Eastpointe to give this place a try, and I would consider my experience very satisfying. 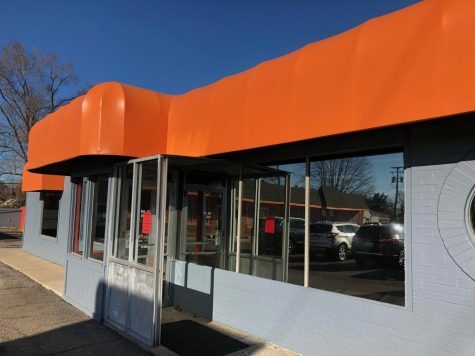 To start, the exterior of the building wasn’t too promising given the bare orange, nameless awning and the plain gray brick walls. The only way I figured out is was the right place was the sign, but if it weren’t for that I would have completely missed it. The outside of the joint, which disappointed compared to the food inside. Photos by Spencer Rajewski ’21. Once inside the doors I was completely in awe as the interior was very new and the atmosphere was very inviting. The red and grey color scheme with the rock-and-roll playing in the background gave it a very Detroit vibe too. What completed the look was the diner-style seating and the large comfy booths in the back. The menu mainly consisted of burgers, sandwiches, fries and milkshakes. I ordered the Andy All-Star Burger, french fries and an IBC root beer and was definitely not let down. The very simple burger choices made it easy to choose which one I wanted and the size of them was very filling. All of the burgers come with a different type of Spag sauce and in my case, my burger came with Signature Vintage Burger Sauce, which was obviously just 1000 Island dressing. Ketchup, mustard and even malt vinegar were also options at the condiment table. The “Idaho Hand-Cut Fries” were also very tasty and not too salty as many burger joints tend to make them. I also enjoyed the wide variety of old-school sodas such as IBC and Faygo. The costumer service, for being a newly-opened restaurant, was very exceptional and I was very impressed with the short wait time for our food. When we were ordering, the cashier was currently being trained by a fellow employee but even though she was new, she was definitely speedy and very kind. I really enjoyed the order and pickup style of this place as it makes for a quicker meal and avoids tipping, which is always nice. All the staff seemed very kind and willing to answer any questions the customer has. My brother and I each ordered a burger and a drink and we split a large fry and our total bill came out to 26 dollars. I found the pricing of this establishment standard and reasonable. The prices of burgers and sandwiches range from seven dollars to ten dollars and the fires were either four dollars or if you got the works, five dollars. Spag Burger has two types of milkshakes, the classic milkshake or the dessert milkshake full of toppings in and outside of the glass. The regular milkshakes are four dollars and the dessert milkshakes are nine dollars. Overall, I was very content with my trip to Spag Burger and hope to make many more trips in the future for their delicious food. I would rate Spag Burger a 4.4 stars out of 5, only because the outside of the joint wasn’t too appealing. I would recommend this place to anyone seeking a very good burger with a side of fries.